In January 1818, at the height of his European fame, Antonio Canova, signed a contract for a property destined for the practice of sculpture. This was to favour his favorite pupil, the promising Adamo Tadolini. 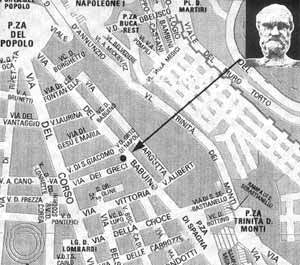 The housings located on the corner of via del Babuino and via dei Greci, and the area of Rome traditionally animated by artists' workshop, was also the site where Canova lived and executed numerous commissions. Considering Adamo the most gifted of his pupils, and maybe his only spiritual heir, he formed an intense collaborative relationship. This is reflected in the number of jobs given to him, and particularly on the singular opportunity to reproduce, under his strict surveillance. 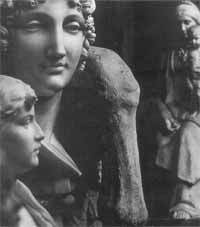 Antonio Canova's most famous works. 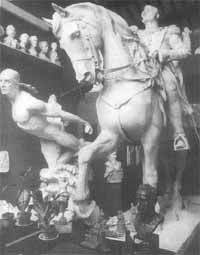 From 1818 until 1967 the atelier in via del Babuino remained in the possesion of four generations of sculptors belonging to the Tadolini family. This way, the art of the animated sculpture, guided by the spiritual climate of the time, was passed on from father to son in a reciprocal relationship. This passage of time is marked in sculpted marble, giving testimony to the memory two century of Italian sculpture. This is visible, within the atelier, in the preparatory models of finished works situated around the world: inthe sculptures in marble and bronze: in the anatomical exercises: and lastly, in the mechanical instruments used by the artists. The recent restoration was a sensitive operation to salvage the unique atmosphere of the once disorderly atelier. This was done by respecting the original colours of the decoration and materials and the casual placing of the works. The precious atelier, probably the only surviving exemplar of the sort, houses a collection grouped together in casual arrangement failing to follow a systematic order. Thus, the juxtaposition of works by Canova and Adamo with more romantic works, or with works of a more political tone such as the ones by Scipione and Giulio, or even with the more intimate world of Enrico is voluntary: fulfilling the creation of a timeless atelier. Leaving scope for the imagination to travel without barriers, from the neoclassical grace towards the bourgeois dimension of the twentieth century. A journey accompanied by a magnificent collection of sculpture.